Founded in 1900, University of Birmingham is England's first civic university, where students from all religions and backgrounds were accepted on an equal basis. The University of Birmingham was established by Queen Victoria by Royal Charter in 1900 and was the UK's first civic or 'redbrick' university. University of Birmingham was named University of the Year 2014 in The Times and Sunday Times Good University Guide in October 2013. The University of Birmingham is also named the University of the Year for Graduate Employment 2016. 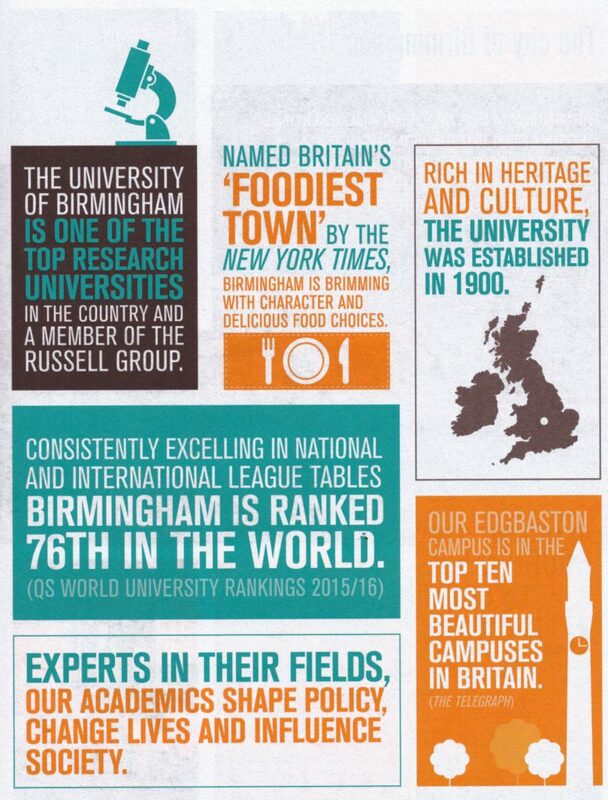 Birmingham is a truly global university producing world-leading research. University of Birmingham has over 5,000 international students from more than 150 countries, and 31% of academic staff from overseas. 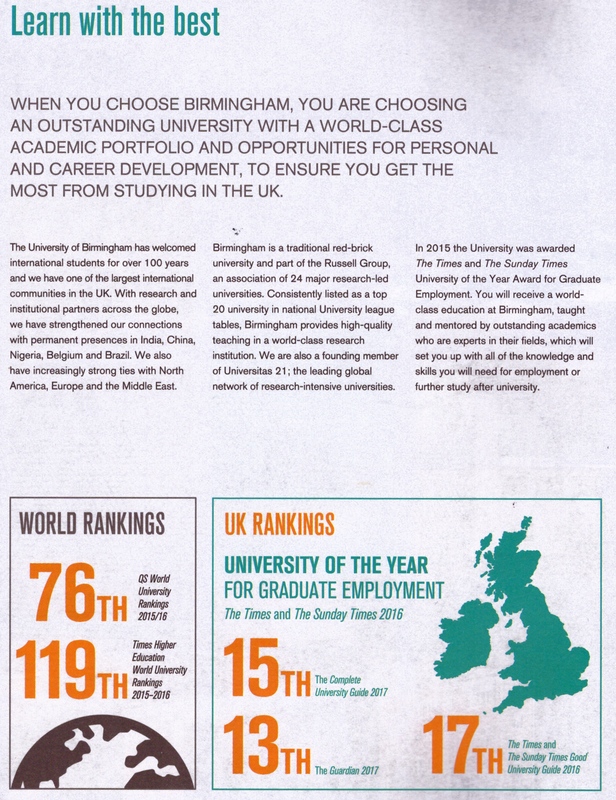 The University of Birmingham is one of the top research universities in the country and a member of the Russell Group. 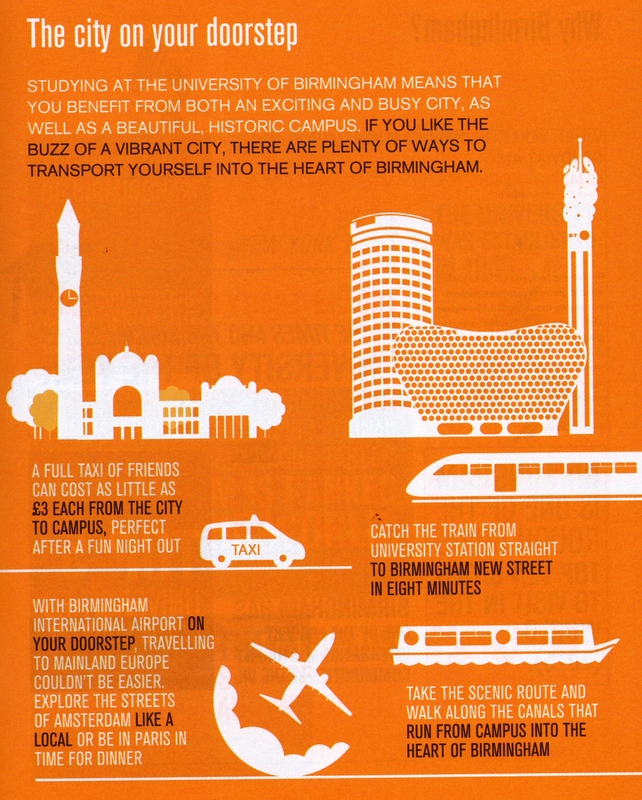 Studying at the University of Birmingham will allow students to benefit from both an exciting and busy city, as well as a beautiful, historic campus. The campus has been named in the Top Ten Most Beautiful Campuses in Britain by The Telegraph. University of Birmingham is ranked among the Top 100 University in the world with world-leading research with a vibrant international student and staff community. Outstanding performance across the league tables and Birmingham's bold and sector-leading initiatives were recognized by this prestigious accolade. 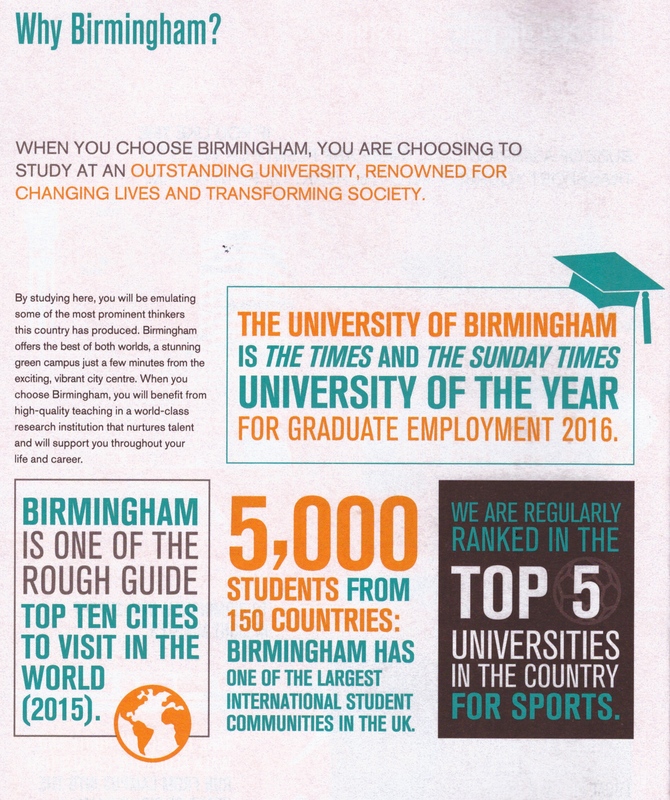 University of Birmingham is also regularly ranked in the Top 5 universities in the country for Sports. Academically, the University’s strengths lie in Computer Science (1st), Drama & Dance (1st), Education (6th), English (6th), Social Work (8th), Sport Science (9th), Philosophy (10th), Law (13th), Music (11th), Chemical Engineering (3th), Civil Engineering (6th), Physics (2nd) and Bioscience (3rd).